The Children's Collection created this paper listing of the popular children's book awards, such as Caldecott, Newbery, etc. This list includes the last five years of the awards. This list is arranged by award, then year, providing the title, author, date, reading level and TWU Call Number. This includes a listing of children's literature awards, description, who does it, link to TWU list of titles of the award (if available) and a link to the web site. 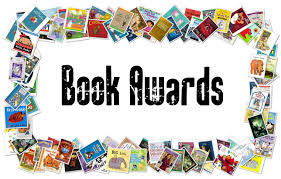 This set of pages includes book awards for adults and children’s books. See the drop down Book Award tab at the top for more information.